was all wrong. Of course, I forgot to take a picture before it was painted white. put it on canvas for us. I am in love with the colors in the canvas. 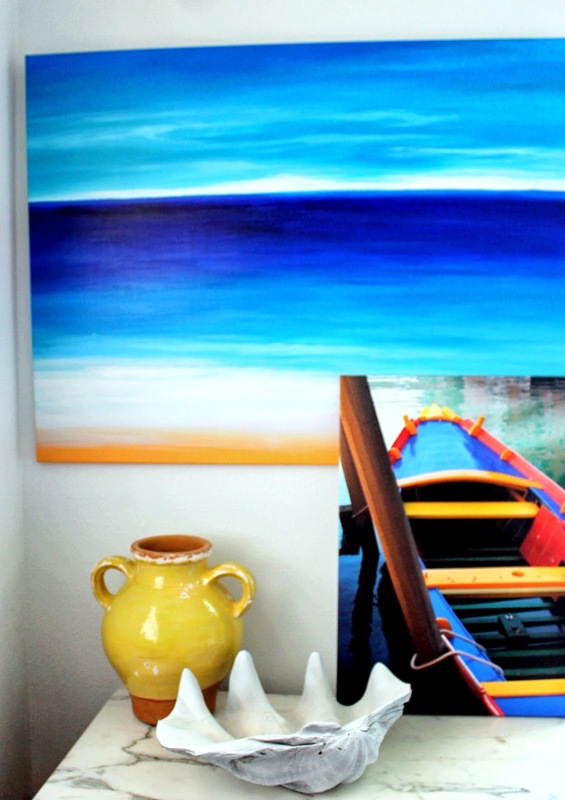 beautiful beach abstract will be perfect over our mantle. The clam shell is great and that picture is beautiful. I love the colors too. The little vignette is so great. Have a great week. Sherry, painting the clam shell was a good idea. I had several conch shells that were gray and I donated them to the GW. I should have painted them! Love the colors in the painting! I love adding a touch of beach and coastal here and there too- love the shell and artwork! What a pretty and colorful vignette you have made! 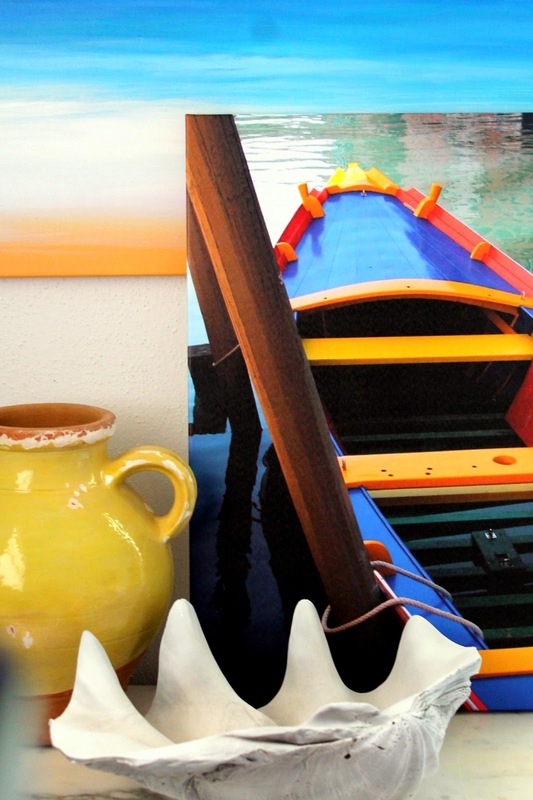 The canvas with the boat picture is wonderful and the shell you found, with its new paint job, is so pretty. The canvas print is so beautiful. I was convinced it was a painting. That clam shell is great!! And a bargain too. Looks very familiar, Sherry! ;) Love the vibrant blue of the Greek islands. Lucky you to be taking a photography course! Beautiful colors in the picture and LOVE that shell! I'll be on the lookout for some at the beach (N.J.) next week! Wonderful clam shell you have here. Come by today and grab my starfish featured button for your blog…yes…I have featured you at my party this week. What cheery and delightful colors you've chosen for your new home and these accessories are perfect. 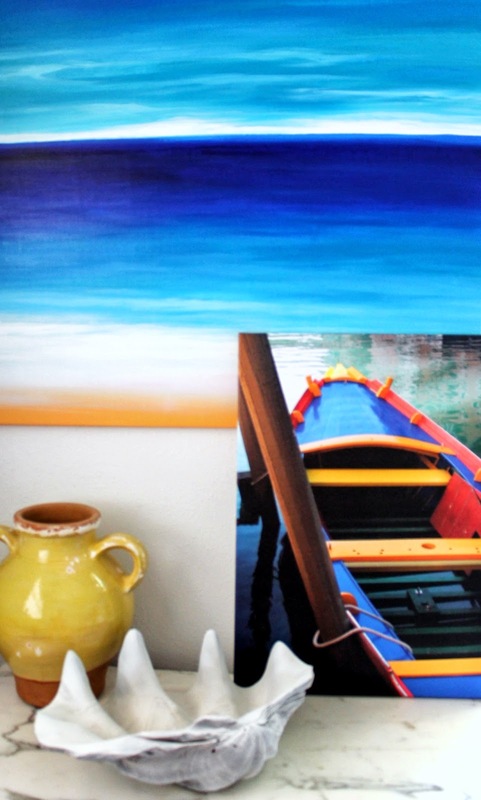 Having your photos put on canvas for one-of-a-kind art is spectacular! Since you mentioned the painting that will go over your mantle, does that mean y'all have bought your new home or that a mantle is one requirement for your new home?